So many of you know that The Geeks are huge horror movie fans. We especially love Found Footage films. When we found out that there was going to be a 3rd Blair Witch film, we knew that a) we had to see it and b) we had to make a recipe inspired by it. 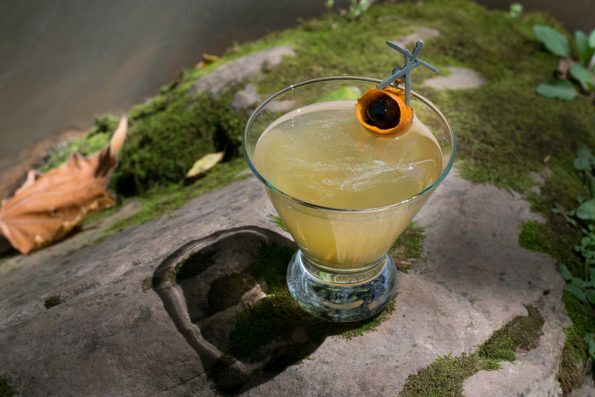 After much debate and about 3 different iterations The Black Eyed Stickman, a riff on the Preakness (the Maryland equivalent to the Kentucky Derby) cocktail the Black Eyed Susan was created. Our process started by researching spirits and recipes from Maryland. Sadly, Maryland spirits stay in Maryland. Therefore, we went with Sloop Betty Vodka which is bottled there. Our second method of research came in the form of Gregory Priebe’s book, Forgotten Maryland Cocktails: A History of Drinking in the Free State. In our initial online research we came across this book and knew it needed to be added to our collection. After flipping through it and given that vodka was the only actual Maryland ingredient we could get our hands on with such short notice, The Black Eyed Stickman came to be. In addition to this fun video, with a little help from Fingerpaint Marketing, we have a giveaway! Enter below for a chance to win a sneak peek at the new Blair Witch movie! The screening will be held on Wednesday, September 14 at Harkins Tempe Marketplace. This means unless you plan to fly in, you must be an Arizona resident. The screening is first come first serve and it is suggested that you be there at 6:30 to guarantee your seat. Good luck and Cheers! Combine all ingredients (except garnishes) in shaker. Garnish with Orange Peel and Luxardo Cherry. *The Geeks attended a sneak preview of The Blair Witch and received promotional material in order to research theming for their cocktail but received no other compensation to facilitate this write-up; opinions are wholly our own. Screening tickets provided by Fingerpaint Marketing. View our Disclosure Policy for more info. This seriously sounds really good. I can’t wait to see the movie, either! Love the video! Thanks for mentioning “Forgotten Maryland Cocktails”! This sounds so yummy! We could totally see one of our brides using this for a signature cocktail at a wedding!